Be careful not to spill the brake fluid. Brake fluid spilled on the vehicle body will harm the paint surface; wash it off with water and wipe clean quickly if spilled. Bleed air from the oil line with help of a co-worker. 1. 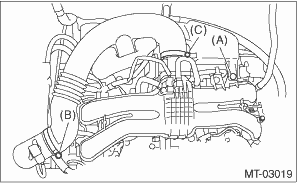 Remove the clip (A) from the air intake boot. 2. Loosen the clamp (B) connecting the air intake boot and air cleaner case (rear). 3. 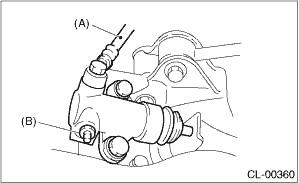 Loosen the clamp (C) which connects the air intake boot and throttle body. 4. 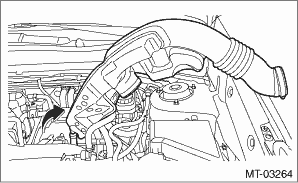 Remove the air intake boot from the throttle body, and move it to the left side wheel apron. 5. Fit one end of a vinyl tube into the air bleeder of the operating cylinder, and put the other end into a container. 6. Slowly depress the clutch pedal and keep it depressed. Then open the air bleeder to discharge air together with the brake fluid. Release the air bleeder for 1 or 2 seconds. Next, close the air bleeder, and slowly release the clutch pedal. Cover the air bleeder with cloth to prevent brake fluid from being splashed on surrounding parts when loosening the bleeder. 7. Repeat procedure 6), until there are no more air bubbles appearing from the air bleeder. 8. Tighten the air bleeder. 9. 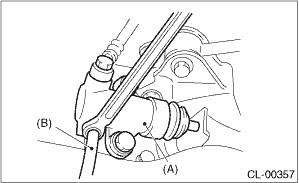 After stepping on the clutch pedal, make sure that there are no leaks evident in the entire clutch system. 10. 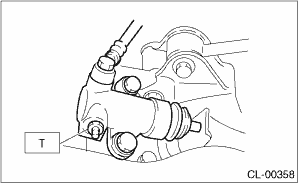 After bleeding the air from clutch system, ensure that the clutch operates properly.